Thanks, Frootloops.... I, and I'm sure everyone else will be looking forward to seeing that sketch! How often do you see the white masses when awakening? It's been about 6-7 years since I last seen one. It too is a weird experience, because it's dark in the room, but these things are illuminated white, but they don't give off a glow. Honestly, ok, if you think about it, remember how cartoons draw ghost as sheets, it's kinda like that, but no eye-holes. Did it happen often before 6-7 years ago? And what do you think happened to stop it? I've seen it on and off most of my life. It's probably mine lol. I am sure it's still around here, it just comes in various forms, like sounds, floral smells, sweet sugary smells, and some other things.. non-threatening things. Not that I can recall, if it did, it wasn't very noticeable. I also like to note, that the acoustics in our current apartment are weird, so I do deduct every possible thing befor I dub it as ghost noises. Also, here is my picture... 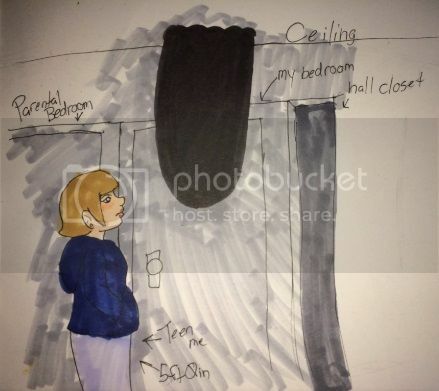 I made the ghost as black as possible, and the light gray of the hall is there because there is a little light from down stairs, so it is isn't completely dark, and the dark gray in the closet is what normal dark looks like compared to the shadow ghost... It was the only way I could emphasize on how black these things are. And I added lil' teen me, for scale, and how it would look like in 3rd person mode. Wow... that's exactly what we needed to see, Frootloops! I love that you showed us just how much darker the shadow ghost was by comparing it to the dark closet. ...........genius! And you compared it to yourself for size comparison. That's exactly what we need to see and understand. You even helped us to understand the depth of darkness of the hall by factoring in the mild light from the downstairs. And lastly, the chill factor of seeing the shadow ghost the way you saw it.... it must have been horrible for you! But you went through and entered anyway. You mustered up the courage because you knew it was safe for you inside. Unfortunately, the shadow ghost knew that too! And the illustration shows it's sly tactics in trying to keep you out! Thank you for the lesson in combating evil! You did good, kid. From a scientific viewpoint, you helped us to best understand all the conditions at the time. I'm not sure I am reading your height exactly though, at the time... can you type that out? Thank you... I so appreciate your artistic ability... I'm sure your illustration and story will spread quickly throughout the world. You have actually shown us a fresh angle concerning the extremes a shadow ghost will resort to in order to get it's way. But it didn't work with you... bravo! 5 feet and 0 inches. Lol, I am short. Thank you and your welcome. It only took like 5 minutes to draw and color. I hope it helps people in some way, if not, well that's ok. We each have our own experiences.. some more crazier sounding than others. The shadow men(porch and cellar), that I've seen in my home, are approx. 5½' to 6' maximum. The white shadow person i saw by my fireplace was approx. 5½'. i would love it, if my "puppy" Ben would come back for a visit. I really miss that sweet Black Labrador. He always had a doggy smile and puppy wiggle for me, when I'd come home. I know I never will, because he hated being in our house. We'd bring him in, when the weather was too cold for animals outside. He'd lay at the door whining, begging to be let out. Even when I'd sleep there on the floor next to him, he'd still whine and beg, with his nose to the door. So we tried putting him in the cellar. It was even worse, he'd whine and bark begging us to let him outside. I believe so NW. Ben was fine at my brother's house. He just didn't like it in mine. I can't blame him, sometimes they freak me out. I am curious if anyone knows if these things are noted in any of our ancestors tales, or if these things are a recent thing, like in the last 100 years or so. I would suggest that they have been around since the beginning. I have seen shadow people when I have sleep paralysis often accompanied by a small smiling rake like creature who sits on my chest, or at the end of my bed. I saw some in the desert one night when I went for a walk about ten at night. There was several of them of different heights standing next to a large cactus in the moonlight, their bodies were thin like a piece of paper. I saw one once. I didn't know what it was at the time. And in the most unusual place. I was at work, I had just gotten there and it was still dark outside. I started work very early, like 5:30 am. We were sitting outside, and it was storming. We smokers had a large metal carport with picnic tables that we had to use as our smoking area. I had time before work, so that is where I went until time to go inside. Like I said, it was storming, raining, the wind was gusting, and it was very dark outside. I was facing the building, and was far enough away that I could see the roof. It was a very large building with different heights to the roof. I was watching the back of the building, which set lower than the main roof. There was a very dark, something, almost like a very dark smoke, darker than everything around it. And it was moving against the wind, back and forth on the roof. Sometimes it would go with the wind, and sometimes it would move against the wind. It was just messed up. I watched for several minutes, wondering how that could happen. It was not a shadow of an object. And as dark as it was outside, it was even darker. It didn't have a shape really, but was about the size of a person. If I had to say, it was like a pillar of dark smoke, holding together somehow, yet changing shape constantly. It sure did make some moves though, darting around on that roof. Almost like it was playing with the wind, if that's even possible. I finally went inside to work, and I never saw it again after that. Snickers... It sounds like it was playing in the storm or it had became frantic and disturbed. 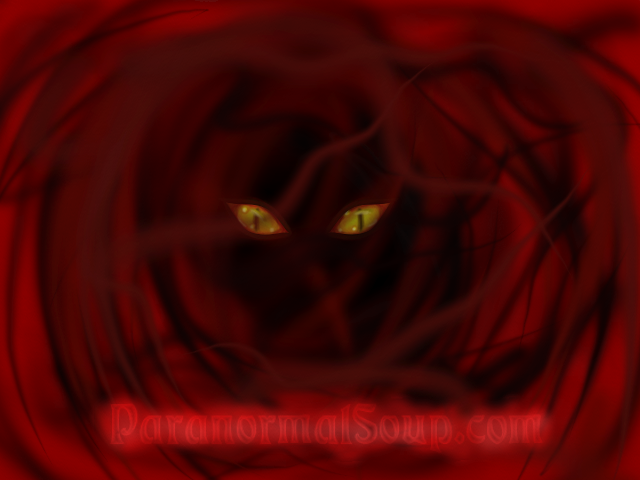 Many actually report that shadow ghosts are darker than their dark surroundings and darker than dark. So it makes sense to consider it a shadow ghost. So unless there was a black tarp tied to something with a rope... and it was blowing in the wind, I think you witnessed something extraordinary! It was definitely not a tarp. It was blacker than black. There were lights on the building, so it wasn't totally dark on the roof, but still pretty dark because there were no lights on the roof itself. It looked like black smoke, but it didn't blow away, it held together. The roof was fairly large, it is a flat roof and lots bigger than a normal house roof. The thing looked like it was playing with the wind, that's the sense I got anyway. It would stop at the edge of the roof, turn around and dart another direction. My first thought was 'that's not possible for something like that to go against the wind.' I watched it for several minutes, it never left the roof, but definitely floated above it. It could rise and fall, then rise again, then dart in a different direction. I never thought about it being frantic, but suppose it's possible. It was raining pretty hard, and lightening and there was thunder, and strong wind. At first I thought my eyes were playing tricks on me, but that was not the case as I watched it intensely for awhile. The thing moved very fast too. 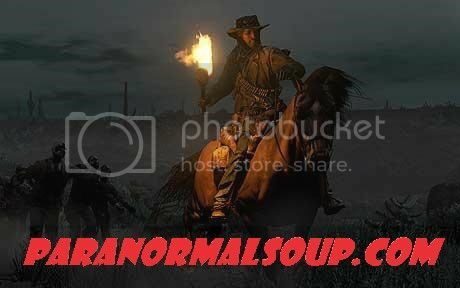 Here are two interesting articles on what shadow people are and what might help to get rid of them!